41 posts tagged with site. It's a new year and there will soon be a new, and very different government here in the U.S. This will be a shift of a magnitude that many have never seen. Some people feel that this new world shouldn't be entered into, by individuals or groups, without a bit of advanced thinking and planning. My question is: Has leadership here at MetaFilter given any thought as to a need to change how the site handles moderation, security, or any other aspect of our lives here, in light of the inevitable upcoming social, cultural, or governmental changes? It seems that http://userscripts.org has been down for an extended period of time, although the site is currently available on an alternate port ( http://userscripts.org:8080/ ). I would like to suggest if you maintain scripts there, that you make them available at another location (perhaps the mefi wiki?) out of an abundance of caution. AskMetafilter is the Cool Site of the Day. Uptime and performance have been awesome for me lately. In particular the days of long downtimes when the admins are asleep seem to be over. On behalf of UK mefites, thanks. I know I'M slow, but Metafilter? I thought I was posting a question on AskMe, instead I posted it to the blue. Can my question be moved? Pretty please? I don't mean to sounds like a complete luddite, but is there advantage to the new ajaxy front page other than being cool and web2.0-ish? Is MeFi protected against cross-site request forgery? My boyfriend remembers a link to a guy who had drawn a multipage picture of loads of fictional characters, real people, landscapes etc. He eventually sold it on ebay. Can anyone remember this link/metafilter post? I'd like to see it and not being able to find it is driving my boyfriend insane! Hey Matt: There's a new coldfusion ajax tutorial out today, if you're looking for one. MeFi is weirdly halting and slow whenever I load the site, or click into a thread. So, noticing my status bar, what I does is, I adds js.spellcheckthis.com to the 'Block retrieval of URL' list in my favorite local-proxy-crud-removing app, and fazowie, it's snappy again. I know some people love their spellcheckers, but if it's having the same effect on everyone, it seems like a... suboptimal solution. The metafilter.com domain name seems to be dying. It resolves if I access the internet one way, but not if I use my other connection. Here's proof it's not just me. So. Jay-Run was smacking me around earlier when I tried to visit the site. Enough post-election traffic to cause problems or something else? Just curious, the site was really speedy last night when I was checking the huge election threads. A while back (months) there was a site posted that was basically an interactive flash app that had a whiteboard, webcams, and chat. I've tried searching for it, but I'm just coming up blank. Anyone remember what it was and have a url handy? Is there any way we can help to ensure MeFi uptime? Linking the temporary absence of a site is silly. Anyone else having problems with the scroll bars on mefi & meta? Thanks to some in-person help, I remotely did a backup of the old, corrupted hard drive's web folders and deployed everything onto the new drive. Now that everything's back up, it all seems to be working again (disturbingly smoothly if I must say). If you find any problems, let me know here. 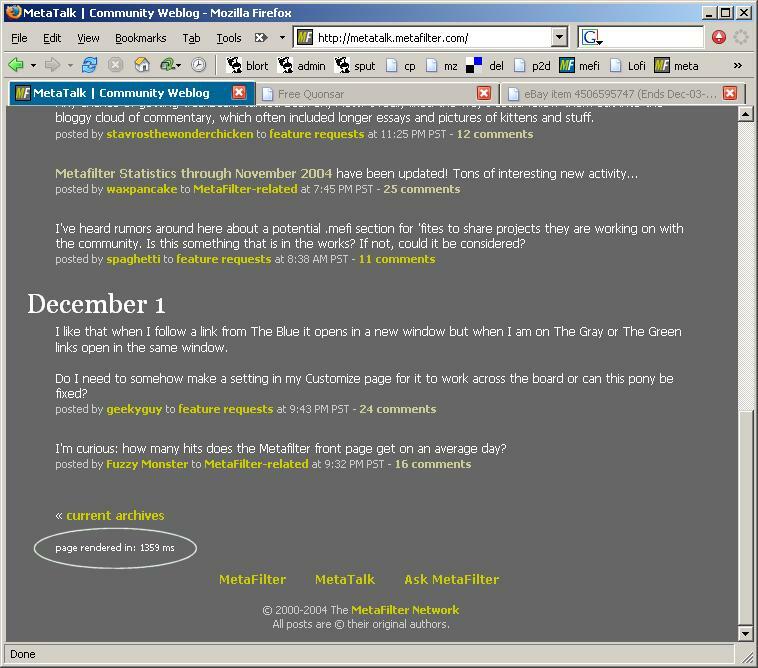 Considering the exponential growth of online community sites like Mefi and Blogger, do you think that one day Metafilter will be (or should be) cloned as localized versions of the site? nyc.metafilter.com, etc. So how's ColdFusion5, Matt? Curious because the last couple of days have been very slow, and I'm getting lots of timeouts. Or is it that you've been in there tweaking stuff? Has there been another huge surge in traffic? Is it just me, or is the site slow today? Stats for April show average daily pageviews over 25,000 now, with nearly three quarters of a million pages served for the month. A typical day I grabbed at random from last week shows about 30k views on weekdays by about 5k different IPs. We seem to be experiencing some slow sledding here. We seem to be experiencing some slow sledding here. Any ideas? Is the 5k affecting MeFi this morning? Is the 5k affecting MeFi this morning? I keep getting timeouts and server too busy messages. I'm getting pretty sick of MetaFilter. Changes are coming very soon. Just so you all know, I'm getting pretty sick of MetaFilter. Changes are coming very soon. Call me mr. crankypants, but the level of discourse here is approaching an eighth grade level. Seriously. A lot of old timers say "it used to be so much better when..." and I hate to say it, but it's true. A long time ago*, people used to be a lot more respectful to others, people didn't attack each other, people of opposing viewpoints could bring their perspective to a topic and not just point out knee jerk political viewpoints and philosophies. Everyday I see the place getting more and more "mainstream" with all the closed minds and inflexible opinions that come with that. Be prepared for the upcoming experiment at MetaFilter. * - and don't go back into the archives and show me a year old thread that got ugly. I know the place used to be better overall, and you're not going to convince me of otherwise, okay? January stats, in case you were wondering. Is Metafilter totally database driven? Is Metafilter totally data driven, partially data driven, or are new posts sort of tacked onto the end of text files? It seems like every feature request that I see involving views (language, filtering, etc.) could be easily solved with a fully data driven site and a couple of competent software engineers. Why is the home page so slow to build? Why is the home page so slow to build? When I go to http://metafilter.com, I have a 7-10 second wait before I start getting any data. Is it just Cold Fusion churning? Link detail pages come over after just a 1 or 2 second pause.